The ebb and flow of the creative process. 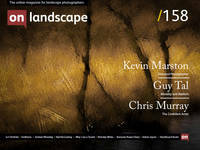 Chris Murray is a fine-art landscape photographer from New York State. His work has appeared in several magazines including Popular Photography, Shutterbug, Adirondack Life, Life in the Finger Lakes, and New York State Conservationist, among others. Chris’ interest in photographing landscapes is derived mainly from his love of the natural world, the same love that led him to choose geology as his first profession. In photography his goal is to make images that are not a literal document of the woods, mountains, and rivers of his home state, but rather a creative expression of his relationship with the places that ceaselessly inspire him. Critical in the growth of every artist is developing the confidence and courage to follow one’s own creative path. A confidence not only in our abilities but also the manner in which we practice our art. We must find the courage to lead a creative life that is often contradictory to current popular trends and practices. Together, confidence and courage enable an artist to practice their work honestly and without regard for popularity or marketability. Without this confidence and courage, we will not be able to create a unique body of work that is true to our convictions and the ways in which we see the world. Insecurity in artists is a common affliction, even in those who have “made it”. Bouts of self-doubt are normal and it may not be possible to banish them completely. At its worst insecurity is that feeling of being a phoney, an impostor. Bouts of self-doubt are normal and it may not be possible to banish them completely. At its worst insecurity is that feeling of being a phoney, an impostor. Compounding matters, we are in the age of social media where it is easier than ever to compare and rank ourselves among a seemingly infinite number of other photographers. Speaking as someone who has never suffered from an abundance of self-confidence, it has been a years-long journey to believe in myself enough to practice my work with conviction. A recent experience provided a litmus test of how far I have come. This past autumn I was one of three leaders on a photo tour in the Adirondack Mountains of upstate New York. The final evening found the group on the summit of a mountain to photograph the sunset, a unique opportunity since the toll road leading to the summit closes well before that time (we had been granted special permission). It is an iconic location that has been photographed countless times, including by one of the leaders of the tour, the most accomplished and well-known photographer in the region. Despite the beautiful sunset I declined to make any photos myself, content to watch the beauty unfold and be of service to the participants. I thoroughly enjoyed the evening and relished the opportunity to simply watch the splendour unfold without feeling the need to photograph it. Later over dinner, the other leader asked if I had captured any good photos. When I told him I hadn’t even take my camera out of the bag he looked at me utterly bewildered. A rare opportunity squandered! I proceeded to list my reasons for such unusual behaviour. I explained that I avoid iconic locations, figuring there is little of myself that I can add to a place that has seen thousands of other photographers. On this particular evening I shared the summit with 20+ other photographers; was I really going to make an image substantially different from the rest? His retort was that we all see something differently, a common belief that I find truer in theory than reality. I am not inspired by such popular locales. I find the experience of making a meaningful photograph in an ordinary location far more fulfilling. More than that, however, I strongly prefer to photograph alone. I find the presence of even one other person incredibly distracting, let alone twenty people as was the case this evening. I do my best creative work when my attention is completely focused on the subject in front of me. But, it also has to do with the ways in which I prefer to interact with nature. Having other people around spoils the experience, and I am a firm believer that meaningful experiences count more than results. I have not become a landscape photographer to simply accumulate pretty photos, I love the experience of one-on-one communion with nature and the inspiration it provides. Despite my explanation, the look of puzzlement never left his face and it was clear he was unable to understand my reasoning. I have not become a landscape photographer to simply accumulate pretty photos, I love the experience of one-on-one communion with nature and the inspiration it provides. As recently as a couple years ago I would have been racked with self doubt had my methods and practices been questioned by a more accomplished and respected photographer. Not anymore. Instead, my question for him, one I did not ask, was how he could find something truly novel in a place with which he was so familiar and had photographed many times before? This is not to imply that his methods are wrong, simply that our approaches are very different. In a way, my confidence was buoyed by his lack of understanding. If everyone “gets” you then most likely you’re not being true to yourself. So what had changed for me? In my former career, I was a geologist. Growing up I was good in math and science and thought that was my path. I have no formal education in the arts and believed that I had no natural aptitude. As a photographer, I am completely self-taught, which I believe is a big reason why I have struggled with confidence. Who am I to call myself an artist? I realise of course that a formal education is not a prerequisite for becoming an artist and that many iconic photographers were and are self-taught. Nonetheless, for me, it created doubt and the feeling that I was not qualified. With time and practice, I became technically competent enough to routinely produce quality images similar to what I was seeing in the landscape photography magazines of the day. Back then it was having my work accepted by magazine editors, calendar publishers, and stock agencies that began to build my confidence. Still, over time I gradually came to the disturbing realization that while my work was good enough it was not exceptional. Worse, it was not unique. Any photographer of similar skill could have produced the same images. The majority of the photographs weren’t creative or personal. They weren’t me. I admit to being somewhat old-fashioned in terms of my subject matter and the way I approach it. I have little interest in astrophotography or video. I will never own a drone. I prefer simpler photos that rely on creative expression rather than those that require almost herculean feats of technical wizardry. I favour subtlety and prefer quiet and intimate images to grand landscapes. I avoid iconic locations. I don’t view photography as a social endeavour and I strongly prefer to shoot alone. I am certain I am far from alone in my preferences, but still, I often feel alone in thinking this way. A turning point in my development as a photographer was becoming a student of the medium. This is what built my confidence. I am ashamed to admit this, but for too long I trudged through photography with little or no sense of its rich history. My work suffered for it. I was technically competent, yet creatively adrift. Once I began to learn about the work and philosophies of the photographers who paved the way it was like an awakening. Much has obviously changed over the years, but the core principles of photography as an art form have not. In particular, the works of contemporary artists such as Guy Tal and Chuck Kimmerle have had a tremendous impact on my confidence. It is as if they have given me permission to pursue my work on my own terms, however different they may be. I believe anyone familiar with Guy and Chuck would agree that they are a breath of fresh air in this environment that seemingly favours technical solutions and stunning landscapes to improving one’s photography over the refinement and development of expressive skills. The answer lies within. Creating a body of work that is original and consistent with vision or voice (or whatever you call it) is the most difficult challenge facing any photographer. I’ve quoted Chuck Close at the head of this article because there is no more succinct and accurate description of photography. Creating a body of work that is original and consistent with vision or voice (or whatever you call it) is the most difficult challenge facing any photographer. The only way to do that is to produce honest work, work that truly is a reflection of your own sensibilities and relationship with your subject. That ability to be completely honest is derived solely from inner confidence. Confidence begets honesty because we are free from outside influences and pressures. It used to frustrate me terribly to miss photographing a stunning sunrise, regarding it as a missed opportunity to make an image that would prove popular and marketable. I realise now that such images, as beautiful as they may be, are, for me, a dime a dozen and creatively bereft. I have been there and done that. I now have the confidence and courage to seek something greater, something more personal and infinitely more rewarding. I am seeking myself.